I doubt that my readers have been kept awake by the mysteries contained in this photograph, but I decided to open the discussion to the members of a jazz research group that includes the most respected jazz scholars . . . and they added a few insights. 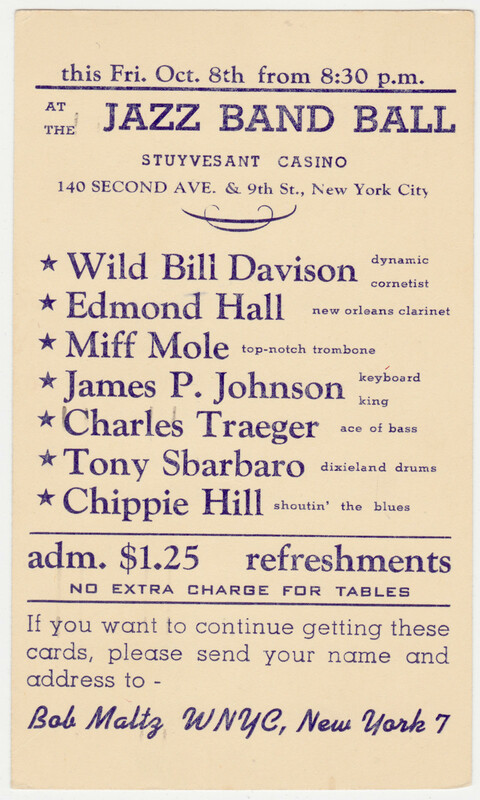 Michael McQuaid had suggested that the unknown baritonist might be Bill Miles — only on the basis of Miles’s apprearance on some Wild Bill Davison Commodores. Plausible, but neither of us had any idea of what Miles looked like. Your photo sent me scurrying to my photo collection. I’m pretty sure your man is Billy Miles. I have him in a photo that Joe Darensbourg gave me showing a jam session at the Blue Bird in LA in the early 1950s. 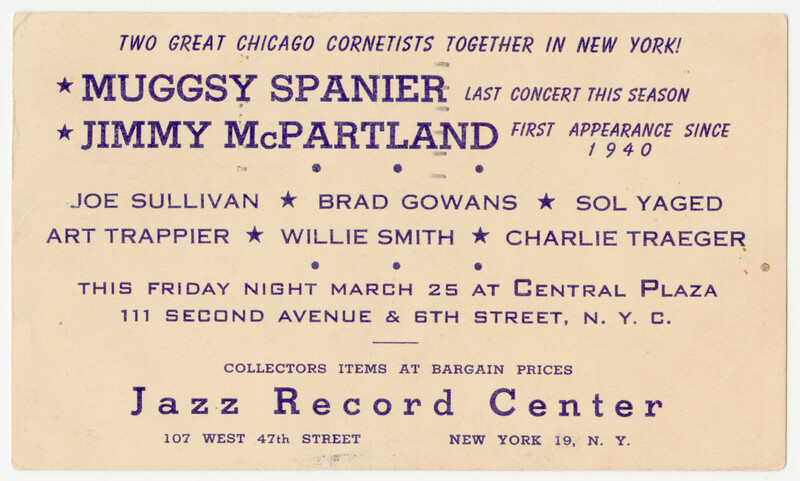 It’s an interesting line-up with Joe, Chicago drummer Bill Winston (visiting from Honolulu) and Billy Miles, playing baritone, among others. My picture shows Miles as identical to your picture, same facial expression, parting and hair style. Case closed? Hope so. That might have been the end of it if not for Dan Morgenstern, who not only knows things but has been a part of the New York jazz scene for more than half a century. 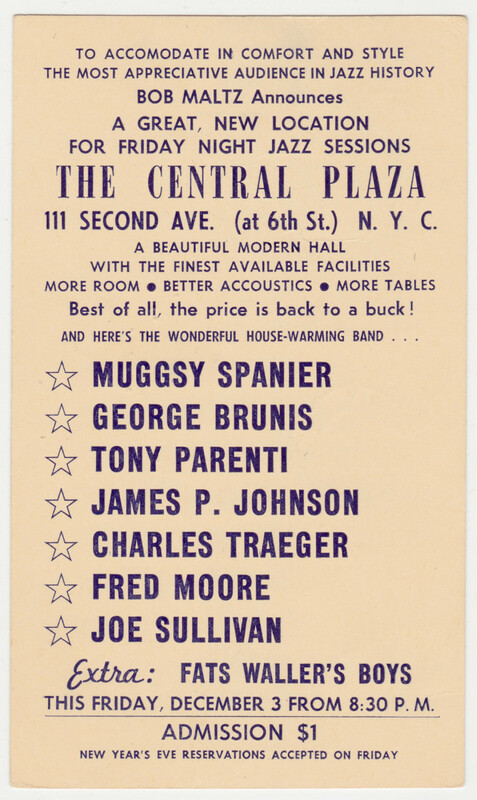 Dan proposed that 1) he had been at Stuyvesant Casino and Central Plaza, both of which were large catering halls (Central Plaza is recognizable in photographs when musicians are posed against its multicolored venetian blinds) and that it might be Lou Terassi’s; 2) the microphone was for radio broadcast; 3) it wasn’t Sidney Catlett but Art Trappier. I had written here that the upholstered background seemed more a night club’s decor, but I was crestfallen to lose Big Sid, with all respects to Art. And there the matter might rest. But what if it was taken at a “Doctor Jazz” broadcast? Doors shut, doors open.